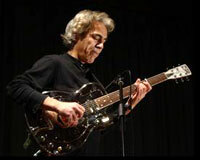 Among guitarists and critics, Woody Mann is considered a modern master. While the country blues are his touchstone, he seems to draw inspiration from every direction, blending a myriad of influences with ease and grace. Pioneering guitar legend John Fahey said it well: “You can hear classical, jazz and blues approaches somehow converging into a single sparkling sound – a sound completely his own. If there was a category simply called great music Woody’s music would belong there”. Since his early days when Woody took his first musical schooling with Reverend Gary Davis, the legendary blues, gospel and ragtime guitarist and with Chicago-born jazz pianist Lennie Tristano, Mann has pursued a rich and diverse career. 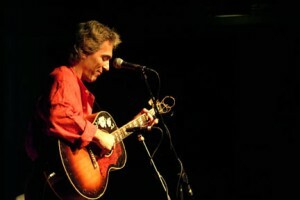 From his first solo recording “Stairwell Serenade” that Guitar Player Magazine included in their “guitar recordings of destiny” he has; performed everywhere from the orchestra pits of Broadway to stages worldwide, recorded extensively as a soloist and in collaboration with legends Son House Bukka White, and John Fahey, been honored by the C.F. Martin guitar company with the release of “Woody Mann” signature model, named as the official USA ambassador the Great Britain International Guitar Festival, and has schooled countless guitarists through his many books and DVDs. Mann’s latest release “Careless Love” features a collection or original tracks ranging from Italian inspired melodies to Southern blues and jazz rhythms. It is yet another inspired set that shows why Woody continues to be an original voice on the music scene. Acknowledging his artistry, the C.F. Martin guitar company has honored Woody with the release of the “Woody Mann” signature model guitar. He is also the official USA ambassador the Great Britain International Guitar Festival, where he has been a frequent performer. As a producer, writer and filmmaker he has co-produced the award winning feature documentary, “Harlem Street Singer”, the story of Reverend Gary Davis, the legendary Gospel, blues, and ragtime guitarist, produced the soundtrack CD “Empire Root Band”, and penned his latest book “Just Play”, combines history and stories of artists Woody has known and worked with including jazz guitarist Attila Zoller, Lennie Portuguese composer Carlos Paredes, and his early mentors Reverend Gary Davis and jazz great Lennie Tristano. Woody has taught at the major guitar workshops in the USA and Europe including Hanover University in Germany and Jorma Kaukonen’s Fur Peace Ranch, been a faculty member at the New School in New York City, founded International Guitar Seminars, and created his own innovative online teaching website. Presently, Woody is a visiting artist at Berklee College of Music in Boston, MA, where he is teaching a new generation of musicians. Throughout his career, Woody has not forgotten those early lessons in the Rev. Davis’ living room or the jazz traditions that were his wellspring. He has become one of the world’s renowned guitar masters – bringing the past up to the present – with his own contemporary improvisational style. The Times (London) said of Woody Mann, “Don’t miss a chance to see him; you are unlikely to hear anything – or anyone better in the field that Mann has chosen to master.” His playing is artful, musical, and so effortless that you almost forget the impossible difficulty of what he is doing. His music runs from country blues to jazz to his own well-crafted originals. He’s a wonderful singer, a charming entertainer, and a legend in the guitar world. ”Don’t miss a chance to see him; you are unlikely to hear anything- or anyone – better in the fields that Mann has chosen to master.” –The London Times.